The 30th of September marks a special occasion in all language enthusiasts’ calendar as on that day we celebrate the International Translation Day. This celebration is a perfect opportunity to consider linguist’s position in the localisation industry and what it means today given the rise in artificial intelligence. Many industry associations got involved in creating some buzz around this special day, even a dedicated #ThisIsTranslation hashtag has been created to give a more pronounced voice to translation enthusiasts on social media. 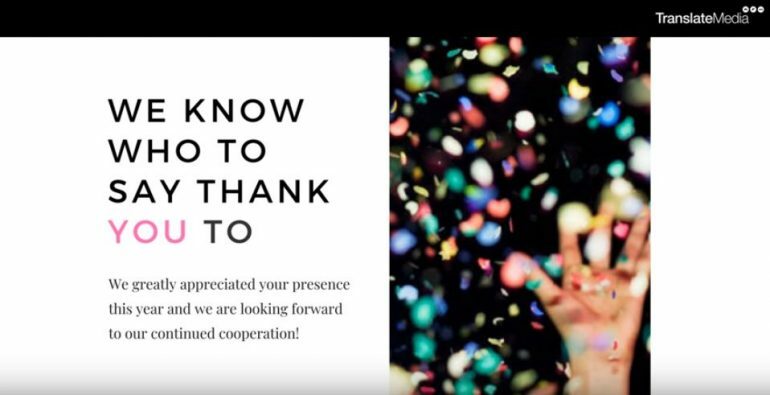 At TranslateMedia, we celebrated with a “Thank You” video that we sent out to all of our 9,870 freelance linguists. Without a doubt, there are reasons to celebrate. Translation is all about making information widely available and therefore contributing to spreading knowledge. Anyone would agree that linguists are at the very core of the localisation process. Without the human touch, a number of aspects of the localisation processes would be compromised. However, translation in its traditional sense has started shifting slightly into the background. Increasingly, linguists are required to take on new roles and perform new types of tasks such as post-editing and validation of machine translation, evaluating machine translation output, providing consultation on machine translation engine training, and others. With the rise of automation and increased adoption of efficiency tools, linguists might find themselves worrying if the trends in the industry are not going to eventually push them out from the centre of the localisation process. A lot of the reservations might stem from the lack of clarity about the objectives of using technologies such as artificial intelligence but, more importantly, also from the lack of transparency as to what the different labels used to describe them actually mean. Terms like artificial intelligence and machine learning are often being confused and used interchangeably, which should not be the case if clarity is to be achieved. This short video explains the difference between artificial intelligence, machine learning and deep learning. Even if the tools and systems are clearly defined, some linguists might be tempted to conclude that increased automation might eventually lead to a reduced number of jobs that they will be offered by LSPs or a lowered perception of the effort required in providing their services. However, in reality, it leads to a reverse trend in the long run. By moving onto services such as post-edited machine translation that can be offered by LSPs at a lower price point, clients find themselves with some of their budget freed up. They then might re-invest that remainder in other localisation services, such as transcreation or multilingual search engine optimisation, that will require specialised linguists to take care of. It is also not uncommon that a conversation between a new client and an LSP starts off on machine translation. Once first few projects are completed and the client has gained confidence in the provider, they progress onto ordering more varied localisation services. This means that offering machine translation often opens new doors to LSPs and as the relationship with clients moves onto more complex requirements, the LSPs are able to offer more work to linguists. Therefore, machine translation often acts as an enabler. More specifically, it creates opportunities where there were none before. In the past, if we think of an online retailer, for instance, they might have been pushed into deciding not to localise certain parts of their website (such as their blog) and only invest in localising the transactional part of the website because they found translating the whole website too costly. With post-edited machine translation available at a slightly lower price point than traditional translation now in the picture, the same client might now decide to start localising their blog content using that cheaper service. Therefore, where linguists would have not had the opportunity to work on that blog content at all, they now have a chance to engage in post-editing that editorial copy. The role of the linguist in the localisation process is undeniably changing but regardless of the intensity of the advances in technology, it is not technology taking care of the translation but the human deciding how to make use of that technology to their advantage as part of the translation process. As Jost Zetzsche, the author of the Tool Box Journal, once said “The public thinks that technology takes care of translation. Good technology is all about making good translations better”.